Democratic lawmakers and Environmental Protection Agency (EPA) workers are mobilizing against Oklahoma Attorney General Scott Pruitt after a judge on Thursday ordered the release of thousands of emails between his office and fossil fuel companies—raising questions about whether the EPA nominee engaged in corruption. In response to the order, Senate Democrats called for a delay on Pruitt’s confirmation hearing, which is still scheduled for Friday after he passed out of the Senate Finance Committee earlier this month amid a Democratic boycott. According to Sen. Elizabeth Warren (D-Mass. ), lawmakers will force a vote to extend the debate at 12:30pm. Oklahoma County District Judge Aletia Haynes Timmons on Thursday gave Pruitt until February 21 to hand over more than 2,500 emails he withheld from the Center for Media and Democracy (CMD), a watchdog group that has been pursuing the documents since 2014. CMD and the Oklahoma chapter of the American Civil Liberties Union (ACLU) filed a lawsuit earlier this month which accused Pruitt of violating the state’s Open Records Act. “[T]here was an abject failure to provide prompt and reasonable access to documents requested,” Timmons wrote in her ruling. That call was echoed by others. Any senator who votes for the Scott Pruitt nomination before we see all the documents Pruitt spent 2 years hiding is engaging in a cover-up. A few hours ago, a judge in OK ordered the release of thousands of emails on @EPA nominee Scott Pruitt’s relationship with Big Oil. CMD’s director of research Nick Surgey said in response to Timmons’ decision, “Scott Pruitt broke the law and went to great lengths to avoid the questions many Americans have about his true motivations. Despite Pruitt’s efforts to repeatedly obfuscate and withhold public documents, we’re all wiser to his ways and the interests he really serves. “The work doesn’t stop here to make sure communities across the country have the information they need to hold him accountable to the health and safety of our families,” Surgey said. Indeed, Pruitt’s nomination has prompted a massive resistance movement, from environmental groups to former and current government officials. 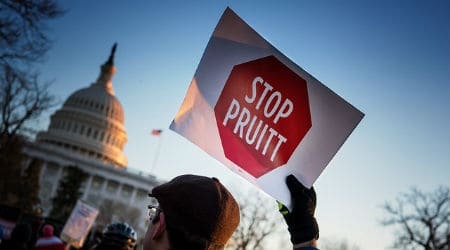 The resistance now includes EPA employees themselves, who have been taking part in a calling campaign urging lawmakers to vote against him in what the New York Times‘ Coral Davenport described as “a remarkable display of activism and defiance that presages turbulent times ahead” for the agency. Faced with a president who has vowed to get rid of the EPA and a chief with a history of litigation against it, the workers see the calls as their duty. “Mr. Pruitt’s background speaks for itself, and it comes on top of what the president wants to do to EPA,” John O’Grady, a biochemist at the agency and president of the EPA workers’ national union, told the Times. This entry was posted in Current News, PPJC Picks and tagged Congress, EPA, Pruitt by PPJC Admin2. Bookmark the permalink.